A gluten free tart is sure to satisfy your need for a dessert that offers a crunchy base with tender baked fruit and nuts on top. 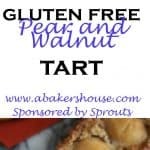 This bake ahead gluten free pear and walnut tart is ideal for sharing while you entertain family and friends this holiday season. Sometimes desserts come about because of a particular craving or a seasonal favorite, and other times it is simply that a baking pan is speaking to me. Odd, right? That this tart pan has been calling my name? I hadn’t used it in ages and now is a good a time as ever. 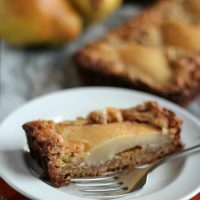 Well, that is how things work in my kitchen and when I saw King Arthur Flour’s recipe for a Pear and Almond Tart, I knew that this dessert could be made equally as well in a gluten free version and with walnuts as a strong pairing with pears. 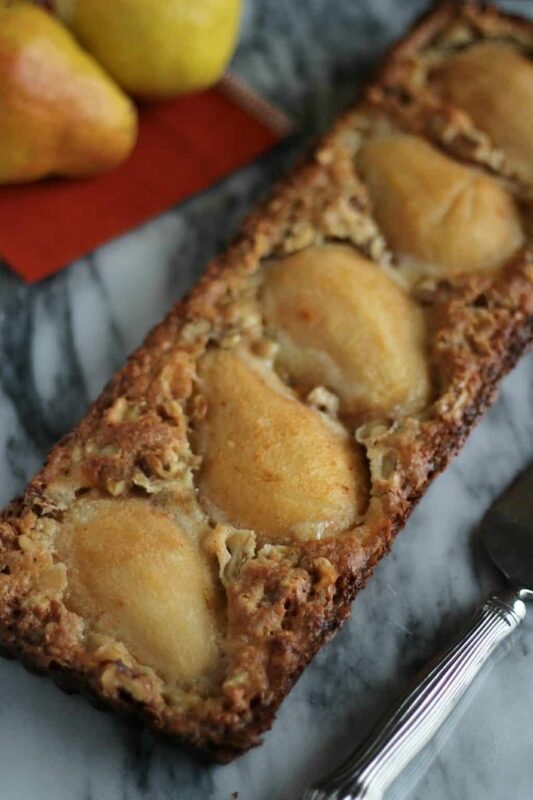 If you don’t have time to make the whole gluten free pear and walnut tart but you need a quick dessert for Thanksgiving you can simply do step one and poach the pears. Serve with ice cream and a drizzle of caramel syrup and no one will complain. Actually that sounds so good I may need to revisit my pears this week! 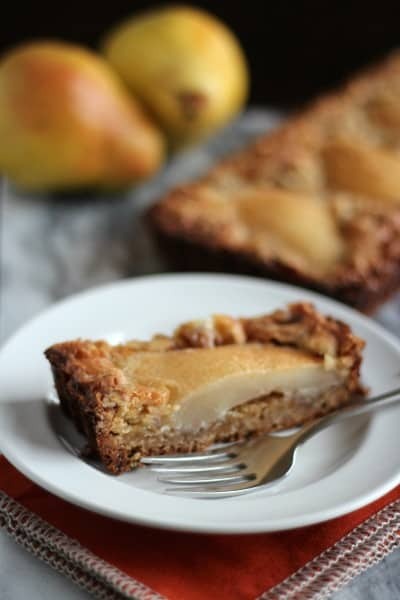 If you have time to continue through the remaining steps, this pear and walnut tart will satisfy the gluten free eaters in your family and it will equally delight those who don’t have special dietary needs. Do you need more gluten free dessert ideas? 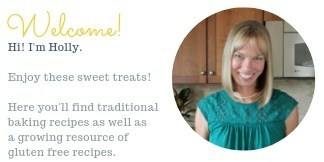 Try these Gluten Free Nutty Chocolate Crunch Cookies. A gluten free tart is sure to satisfy your need for a dessert that offers a crunchy base with tender baked fruit and nuts on top. In a large saucepan combine the water, maple syrup and cinnamon. Bring to a simmer. Peel the pears then place them in the poaching liquid. Simmer for ten minutes then remove the pairs and allow them to drain and cool slightly. Carefully cut them in half and use a melon-baller to remove the seeds. Set aside. In a food processor combine the walnuts, salt, 1/3 cup sugar, and gluten free flour. Pulse until the walnuts are finely ground then add in the butter and the vanilla. Process until the dough is well mixed and starts to pull away from the sides of the container. Use your fingers to press the dough evenly into the tart pan. Place it on a small baking tray and chill it in the freezer for 15 minutes then bake for 20 minutes or until the crust is bubbling and just starting to brown. Remove from the oven and let cool for about 15 minutes so the crust sets before adding the filling. Wipe out the food processor then add all of the filling ingredients except the chopped walnuts. Process until well blended then add the chopped walnuts. Gently place the pear halves onto the tart crust and filling. Bake (with the tart still on the baking tray) for 38-40 minutes or until the top is browned. Cool on a wire rack before removing from the tart pan. This recipe is adapted from King Arthur Flour's recipe for a Pear and Almond Tart. I love love love this tart. Gorgeous colors and looks so beautiful!! Thanks, Ansh! Pears are one of my favorite ingredients this season.